Parsons Green Prep School has won the award for Outstanding Provision in STEM (science, technology, engineering and maths) at the Independent Schools Association’s (ISA) annual headteachers’ conference and awards dinner. 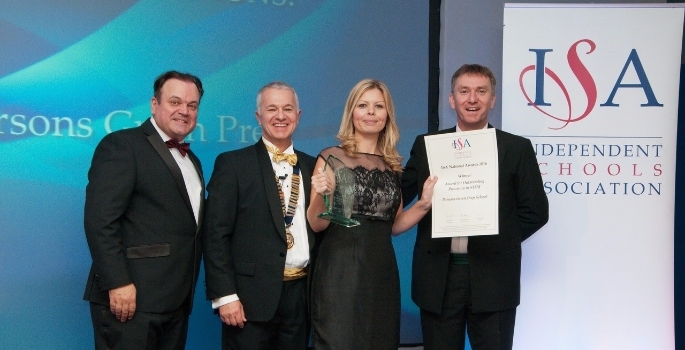 The ISA Awards is an annual event which invites entries from the schools of over 380 ISA Member Heads in a range of categories, recognising achievement in academic and extra-curricular provision and community and outreach activities. Shortlisted schools are invited to attend the gala dinner, where winners are presented with their ISA Award. A range of additional awards are also available for Member schools for excellence in provision and also individual GCSE performance. The awards cover categories ranging from IT innovation to healthy eating and international understanding. For the STEM award, the judges looked for evidence of outstanding provision in STEM disciplines. This might include innovative teaching methods, extra-curricular provision or engagement with the wider community. The shortlisted schools were Alton Convent School in Hampshire, Parsons Green Prep School in London and Hatherop Castle School in Gloucestershire. Parsons Green Prep integrates STEM skills across the curriculum, with a view to inspiring and encouraging pupils to develop their enthusiasm and skills in these areas. Through STEM, pupils also develop a valuable set of skills including teamwork, independence, reasoning and critical and creative thinking. STEM at PGP is promoted in a variety of ways. Each term we have whole school STEM-linked activities, including assemblies, curriculum-themed days, workshops and a weekly STEM after-school club. CREST activities (creativity in engineering, science and technology) are another way of inspiring our children and enriching our STEM-led curriculum. Designed by the British Science Association, our activities enable children to solve science, technology, engineering, and maths problems through practical investigation. Engineering is incorporated into the school curriculum through weekly STEM lessons throughout the school. These tasks encourage creativity, problem solving and teamwork. STEM ambassadors are invited to the school to enhance the children’s learning experience. These ambassadors come from a variety of backgrounds and include zoologists, climate change scientists, engineers of all disciplines, geologists, physicists, nuclear physicists and architects. Their enthusiasm and commitment help encourage young people to engage in STEM subjects and see the career possibilities that come from learning and linking STEM subjects. To find out more about Parsons Green Prep School visit their website.